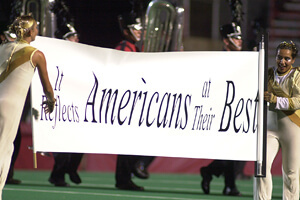 During Drum Corps International's 30th anniversary season of 2002, the Cavaliers achieved one of the only two three-peats in World Class World Championship history, capping an undefeated season in Madison, Wis. Still, it was quite a competitive season, as witnessed by the fact that in Quarterfinals, only 1.95 points separated the 10th through 15th place corps. Through much of the season, it seemed that as many as seven corps could grab the last three of the 12 finalist positions. After the Semifinals, three corps would progress into the Finals that weren't finalists the year before: 10th place Spirit of JSU made it in for the first time since 1990, Magic of Orlando after being inactive for two seasons returned to the big show in 11th, and Seattle Cascades took 12th with an all-Bernstein show. Among some of the other highlights: Blue Devils opened their show with a silent movie look and a player piano sound, the Cadets threw a party on the field with "Boogie Woogie Bugle Boy," Santa Clara Vanguard's entire show explored three geometric shapes, and Phantom Regiment revisited the music of Shostakovich, ultimately tying with Boston Crusaders for 5th place. Crusaders' show, "You Are My Star," was a commemoration of America and Americans, focusing on the individual and collective values and accomplishments of the nation and its people. During the quiet opening strains of Aaron Copland's "Appalachian Spring," three banners were unraveled that stated, "America/Land of the Free/Home of the Brave," as the vibraphones in the front ensemble offered a hint of the song, "America." This led into a heroic fanfare of Marc Shaiman's main theme for the film, "The American President." "Appalachian Spring" returned in the jubilant quick-paced section that followed, culminating with eight counts of silent drill formation pass-throughs and a banner proclaiming, "Liberty Is Always Unfinished Business." A front ensemble transition brought all members to the front, where they sang the following lyrics to the introduction to Robert Seeley's "You Are My Star," a work originally written for men's chorus: I remember you All through my days And into each night. Without you, on my own Without you, on my own Oh! How I miss you! During this, large photographs were unveiled of Martin Luther King, Jr., Jackie Robinson, Albert Einstein, Leonard Bernstein, Marilyn Monroe and Aaron Copland — all great voices for the freedom of human expression who made America their home. But then the emotional level was turned up several notches with the unveiling of photos of John Kennedy, Jr. saluting the passing of his assassinated father's funeral cortege and one of a New York City fireman mourning the immediate aftermath of the 9/11 tragedy, with a lone color guard member facing that photo and giving a salute. This was one of those special moments that is rather difficult to put into words. After the singing, the horns continued on with the melody, forming a five-point star and then moving into one giant arc as each guard member spun two flags of faint images of a five-point star softly emblazoned in gold and pastels. Two banners were unfurled that read, "Stars Give Life To Things/Bigger Than Themselves." The entire corps then ended the piece with the lyrics, "You Are My Star!" As that piece wound down, the drums kicked into "The Music of Artie Shaw," a rollicking feel-good collection of tunes by the famed American jazz clarinetist, composer and bandleader who in 1939 hired a 21-year-old drummer by the name of Buddy Rich. Two banners made a brief appearance to declare, "Jazz…America's Music/It Reflects Americans At Their Best." The following banner, "It Celebrates Life," introduced the color guard and brass dancing a type of jitterbug that was so popular following World War II. The white of the star on the flags and the blue as the background, united with the corps' red uniforms, making this segment a red, white and blue-themed party. One didn't have to listen closely at all to catch the six musical notes of the corps' trademark "Conquest" bugle call. Somehow, this moment blended into the main "Simple Gifts" theme of "Appalachian Spring," the big push highlighted by banners reading, "'Tis a Gift to be Simple/'Tis a Gift to be Free." One final banner reading, "Where We Ought to Be," was spun around to reveal, "Let Freedom Ring," as the brass and drums turned up the volume. That alone would have made a good spot to stop; but the best was yet to come. To the serene ending prayer-like section of "Appalachian Spring," the horns moved to seven simple straight lines parallel to the front sideline, as drums formed a border to a number of blue flags in the upper left block of the form. Other guard members, sans equipment, filled up six lines between the horns. Those guard members and the horns then sprawled out flat on the ground with a single long banner up front reading, "One Nation, One Flag…United We Stand." Thus, the show concluded with an impression of a giant human American flag, the single most memorable image of the DCI season. For this week only, you can save on the World Championship DVD set that contains this complete Boston Crusaders performance, along with all finalists from the 2002 DCI World Championships. Buy the 2002 World Championship DVD set. (Available this week only for $36. Regular price: $45.) Discount DVD offer ends Monday, Nov. 26 at 8:30 a.m. ET.